There are people in this world who are improving their communities every day in small ways that most others will never know about. Tonight I had an orientation for United Through Reading, and I am so humbled to soon be working with such empathetic, principled people. I hope that once I am presenting childhood literacy talks to inmates, I can continue the same high level of quality. My manuscript for Napa is due today. I'm shooting for early tomorrow morning. Normally, I don't ask for special accommodations, but I figure there's little difference between 11:55PM tonight and 6:45 tomorrow. I hope no one from the Napa office has found my blog. Overheard at Starbucks: An out-of-work woman meeting with a headhunter. She seemed to have many years of sales and marketing experience in the real estate field, but was considering an office manager job in this same field. Times are tough. And yet, return to the first sentence. Overseen at Starbucks: Two parents, two grandparents, and none of them noticed their toddler eating crumbs off the floor. I don't mean to criticize of anyone’s parenting skills, it was simply amusing. I think the situation annoyed Louie, though. All those crumbs he was missing out on. Overheard--or, really, just heard--on this morning's MarcFit run: Good conversation with my dear friend Veronika. Overheard at Starbucks: Three teenage girls. Their words were English but I didn't have a clue what they were talking about. I am so old. "When you're in Ms. Frizzle's class, things never happen the way they're supposed to." Great, huh? It's from a Magic School Bus book, one I read this morning to my second-graders. They really enjoyed this story. I tried something new this week and just read one longer book rather than two shorter ones. It also allowed more time for comments and discussion, which was nice. This book is about warm- and cold-blooded animals, and in some sense I just love the idea of an artsy type helping kids learn science. Bryan would be so proud. The first thing he told me, shortly after I'd put my name on the ballot, was to be prepared for everyone to hate me. Now that I've been elected, I'm hoping not everyone will hate me. A few differences of opinion are okay. Once they see my cute dog (and my plate of homemade cookies), I don't think they'll be able to continue harboring hate. I know as my father is reading this, he's thinking, "Oh, to be young and idealistic." Overheard at Starbucks: Lots of noisy kids. Not every moment can be poignant. Feeling flummoxed, I did some web searching to see if I couldn't put Hannah's work in some sort of context. I found biographies, bibliographies, interviews, and fan websites. But then I found a page that made my confusion clear. Hannah has a MySpace page. (Along with Raymond Carver, Ernest Hemingway, and Cormac McCarthy.) He is both too abstruse and too hip for my sensibilities. Or, at least his wily fans on My Space are. Overheard at Starbuck's: a bunch of business/sales/marketing talk. And incidentally, one of the men was a recent hire to a company I worked at shortly after moving back to San Diego from Maryland. Thank God there are people in this world who live for that type of career. I would be utterly incapable in any such role. Any day where someone brings you a typewriter is a good day. Last week, Brian told me he'd have something for me at the next club meeting. At tonight's meeting, he gave me this wonderful 1957 Olympia SM3. Not only is it a meticulously maintained machine, it comes with history! 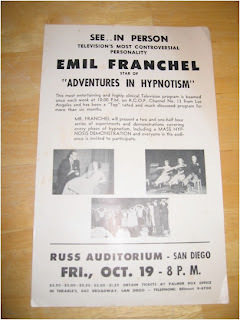 Brian bought the typewriter from a woman managing the estate of Emile Franchel, a well known hypnotist in the middle of last century. 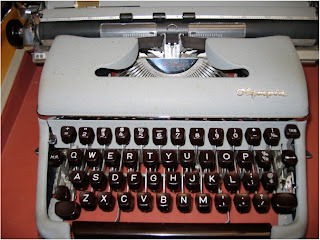 This was his typewriter. Brian originally got it for his daughter when she was becoming interested in writing, but she didn't use it much. I am so grateful he thought to pass it along to me. 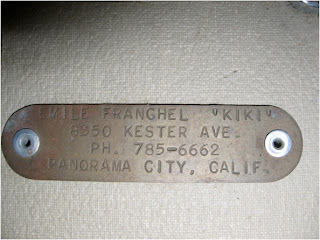 Name plate on the case's outside. I have a manuscript due Monday for Napa, and no good ending in sight. Perhaps this typewriter can help me figure out how things should end up for my boy narrator and his burrito-eating uncle. Overheard at Starbucks: Cantonese, I think. Two men were passing a fifty-state quarter back and forth. I don’t think they were talking about the featured state, but perhaps a game or a utilitarian use for that shiny object. Overheard at Starbucks: a woman asking a doctor friend for advice on her HMO. She has some type of chronic illness and was upset that 1: her health care provider was only interested in managing the pain rather than finding a solution, and 2: she was being forced to play tag with a maze of doctors and health centers. I knew she'd be in good hands with her doctor friend. He'd arrived at Starbucks before her, and while waiting had inadvertently scared Louie (it isn't hard to do). Wanting to make Lou calm, he patiently held out his hand for him to sniff, then fed him a stray Cheerio. Overheard at Starbucks: Actually, it's an encounter at Starbucks. With a young girl of Middle Eastern descent who couldn't stay away from Louie. (I'll admit, he is a crowd pleaser, boasting fans of all ages). She stood right next to him on his chair and pet him, giggling when he'd lick her hand. Then she scooted closer to me and stood with her hand resting on my arm. It was really sweet, except I had writing to do. This girl was so friendly and fearless and eager to receive and give affection in a way that gives you hope. Her parents were worried she was bothering me, but nothing could have been further from the truth. Not after I got full use of my arm back, anyway. I recently blogged about the rise in popularity of literary books about dogs. Included in my post was mention of The Art of Racing in the Rain by Garth Stein. I didn't know anything about the book other than its premise, but today learned more from an article in the current Poets & Writers. The angle of the article (which I recommend) was the long road Stein took from his first book to this, his third. The article also mentioned that several agents and editors rejected the manuscript, their reason being, "I can't sell a book about a dog." It had to smile. The things I overhear at Starbucks every day while writing is simply amazing. I'm going to attempt to make it a daily blog feature. Today's entry: two male friends from high school and now back from their first year of college catch up over coffee (iced--heat wave!). One boy brings along his girlfriend he met at college. They had intelligent (though at times naively judgmental) conversations about world politics, US politics, and college ragers. More interesting, though, was that it truly was a dialogue, they weren't simply telling the other why they should think a certain way, but explaining nuances. And the other person was receptive to it. I think I noticed this because in the portion of Straight Man I read to Bryan last night (we sometimes read books aloud to each other, and are currently working through this comedic novel), narrator and English professor Hank laments the sad state of his department, where no actual exchange of ideas takes place at faculty meetings. Rather, opinions are lobbed like grenades (or the metal end of a three-ring binder, which Hank's nose is impaled with during one particularly heated meeting). It is so true that comedy highlights truth. A member of my email workshop recently remarked, in regards to the story in our group currently up for critique, that its ending fell a bit flat. But that he has reservations about making such a comment, because he himself finds endings difficult to write. Charles Baxter’s Through the Safety Net gave me a lot to think about in terms of endings. In this collection, the endings are definitely in the trail-off vein, rather than being climatic or providing resolution. Which wouldn’t be out of the ordinary—to have a slow end, like the final ring in a string of bell tolls—except Baxter's stories don’t begin by proclaiming what they’re about, either. So you don’t set out with a road map, and the ending doesn’t tell you the ride is over and to unbuckle your belt. And yet the stories are completely round; they successfully exist in the parameters they’ve established. It’s like a glass ceiling on all sides. And for the life of me, I can’t figure out how Baxter does it. Part of the success might be in the third-person voice, which lets you move in and out of places without having to give explanations. Doing so in the first-person would render the voice inauthentic, or make all of your first-person narrators all coolly removed in all the exact same ways (which isn't a very flattering explanation). But anyway, seriously. These stories are good. Can Baxter give us humble writers-in-training a backstage tour? Like Universal Studios. Please? I promise to keep my hands inside the car. And just tell me when the ride’s up, I'll unbuckle and exit to the right without remonstration. "I Didn't Know if She Was Gonna Rub up on Me"
It seems my husband has a bit of bellydancer shyness. Last night at dinner (Armenian/Greek fare) Bryan, Steph, and I were treated to live ude music. Then, towards the end of the meal, dancer Nadira twirled and shook her way around the patio. I thought it was cool, but Bryan seemed a little squeamish. Afterwards, walking to the car, he confessed to be intimidated, because she'd dance directly in front of him whenever he glanced her way. And wouldn't leave. Steph had an acute case of heebie-jeebies, too; she'd watched a young boy tuck a dollar bill in the dancer's clothing. As usual, I hadn't known what was going on. Oh, and...HAPPY FATHER'S DAY, DAD! In one sense, a reader could say they always know what they'll get with a Sherman Alexie story: a Native American character in some sort of dire straits. But that would be where the predictability ends. The stories in this collection contain surprises. Like in "What Ever Happened to Frank Snake Church? ", where Frank learns that the man called Preacher, whom he's been playing basketball, is in fact not a man a God but simply talks too much. And in "The Search Engine," where a college student named Corliss finds an obscure poetry book by an unknown Spokane Native American. All along, the reader thinks the poet will be exposed as a fraud (not even Corliss' mother, records keeps for the Spokane people, has heard of him). But the answer proves more complicated--the poet was indeed Spokane but adopted by a white family--and through this highlights the difficulties of identity, of assimilation, and of being different. You should check this out. It was made by a fellow Maryland alum and depicts Clinton's concession speech. Included are interviews with Terry McAuliffe, Chuck Schumer, and comments from ordinary Clinton supporters. It's a wonderful snapshot of the country's mood during this transitional time. Brian Long recently asked me what triathlons I had lined up (none) and how my training was going (some running, very little cycling, no swimming). He was a bit surprised, I think, but I've been enjoying this slow life. Today, I enjoyed a little more slowness while also counting it as a day on my bike. Steph and I rode around Coronado in the beautiful summer sun. We stopped for corny pictures, picked out our new houses (Steph's choice? An $8.5 million property, but it comes with two houses), and dined at the swanky Hotel Del (in our not so swanky shorts and flip flops). Perhaps the next TCSD club race could be a breakfast with your husband, stroll along the beach, and take your dog to the park. BO and I (and Louie) would have it in the bag. Could Louie Have the Answers? This morning I noticed a customer at Starbucks reading yet another dog-centered book. Now that the Jane Austen-related craze has died down, dogs have become the latest literary "it" girl. There's Pam Houston's novel. And Starbucks' waiting-in-line impulse buy. Two workshop mates wrote or have written a novel from a dog's perspective. And there's another recent dog-narrated book that I'm forgetting. I’m thinking all of this started with Travels with Charley. While I find the canine trend manufactured, and opportunistic--and probably trite and sentimental--I can’t help but agree with its intent. What better creature to take advice from on the most important subjects than one that's never shy about showing affection through a long draw of its wet tongue? I've yet to come across a life-lesson book from a cat’s perspective. It would be an invective on everything wrong with the world. Oh, and it would assail all non-feline house pets. The Summerset Review recently started a feedback program called the Fifty-for-Fifty Contest. Readers respond to a prose piece in the current issue, and the editors select and print the best ones. It's such a simple, smashing idea and I can't believe no one's thought of it before. Or at least, no one's thought to tell me. Check it out. Summer just got a little busier with an acceptance to Squaw Valley. It begins the day after Napa, so I think there's a rental car and a scenic trip in my future. Along with lots and lots of manuscript critiquing. And, if time permits, perhaps a little wine-tasting and a hike. In a preparatory step to volunteering with United Through Reading's Inmate Program, I attended a training session at the local Juvenile Detention facility. For confidentially reasons, I won't be blogging much about my time with the program. But hopefully I'll be able to make vague comments about having a positive impact on others. Stephanie--AKA World's Greatest Maid of Honor--is in town and came up with the brilliant idea of taking a dance class. Never afraid to make a fool of myself, I was up for it. Unfortunately, the class was cancelled, but we ended up at Target and then dinner. I wasn't able to make a fool of myself, but I was able to catch up with a wonderful friend. Good luck, Professor Matt, in Washington. There is a wonderful poem, by Alison Stine, at Linebreak. I am so happy to have been accepted into Ron Carlson's workshop at this summer's Napa Valley Writers' Conference. A child's unflappable urge to tell you a personal story that relates (or doesn't) to the book you're reading to them will never become tiresome. You should read the entirety of this book, front to back, "Towel Season" to "At the El Sol." It seems to me that writers who don't like meeting new people, who are shy, and who when in public put their noses in a book (however good it may be), are missing out on a land parcel of stories the size of the great plains. Stories don't exist only on the page. (Moreover, these written stories often germinate in real-world events.) There are acres of stories that live in people who don't like to write, who've never thought of writing, but who have something about the human experience that they have to share. At my polling place yesterday, us four workers bored out of our civic-minded minds, we started telling true stories. There were wonderful tales of a hotel room being trashed by Roseanne Barr and Tom Arnold; a sailer in protected Pt. Loma waters, who was notified of his location by a submarine, which rose ominously out of the water; being taken for $75 at the border, and being tickled about it; the lengths to bridge-lovers (card game) go to get their fix. *high school students are fond of adorning their skin with stickers and pen doodles. *if a dog isn't allowed entrance somewhere, and the person enforcing the rule loves dogs, the dog will be let in. *some people are simply in a sour mood, and no amount of polite banter will make a difference. *voters who are registered as nonpartisan don't in fact know what this means. *overheard: "Ever since they drafted me, I vote every time." If it isn't too much to ask, could you tell a joke (apolitical, of course) to your local poll workers? I think it's going to be a long, ennui-filled day of low voter turnout. I met up with a friend from grad school, Dave Hancock, who's up in Carlsbad for the week on business. After Maryland I moved to a completely different part of the country, in more ways than one. It was wonderful to spend a few hours with a back-then friend, someone who was equally freaked out by the bombed Pentagon and the snipers and the anthrax and the US invasion of another country. So much has happened for both of us since we left Maryland. And yet when I picked him up at his hotel, he said I was exactly the same. Funny, because I was thinking the same thing of him. Look out, literary journals. We're coming for you. Congratulations to all the Marcfit and Tri Club members who ran the Rock n Roll Marathon. You battled heat, crowds, aid stations without Vaseline, and off-key cover bands. It was harrowing on Bryan's and my side of the race course, too: ornery cops, buggy sidelines, and not much of a breeze when you're standing still. Thanks for making our morning so much fun! I'll save you the breath right now and just say, No, my father wasn't a firefighter. And no, I didn't twirl the baton as a child. I don't have a particular penchant for yard work that involves rakes or shovels or any tool with a long, thin handle. (I don't have a penchant for any yard work, in fact.) No, I began pole-dancing because it was better than circulating through the crowd, giving lap dances. True, the tips are less. But I perform on my small platform well enough to make any difference in pay between me and Desiree, or me and Tanya, or me and Miranda, small potatoes. I would like to think that I could support myself with smiles at strangers, cards to servicemen, animal shelter adoption, Goodwill donations, or loving one imperfect man well. But this isn't a culture where books are commerce, like spices in ancient Asia (I paid attention in high school). We citizens demand more of each other. Of me, you want my taxes paid in full, a pole dance, and a dependable punch line.